Latest data from Nielsen indicates that Google's Android's OS claims the largest share of the U.S. smartphone market with a total of 39%. However, this market share is split between HTC (14%), Motorola (11%), Samsung (8%) and other Android hardware manufacturers (6%). In contrast, Apple's iOS now commands 28% of the market which is well short of Android's 39%, but what is interesting is that because Apple is the only manufacturer making iOS devices it is the leading smartphone manufacturer in the U.S. Meanwhile RIM's BlackBerry OS holds 20%, Windows Phone has 9%, and HP's WebOS and Nokia's Symbian are languishing at the bottom of the heap with 2%. Although Android's OS market share has only grown by a measly 2% since April, it is prudent to keep in mind that WebOS and Symbian's market share is only 2% each. 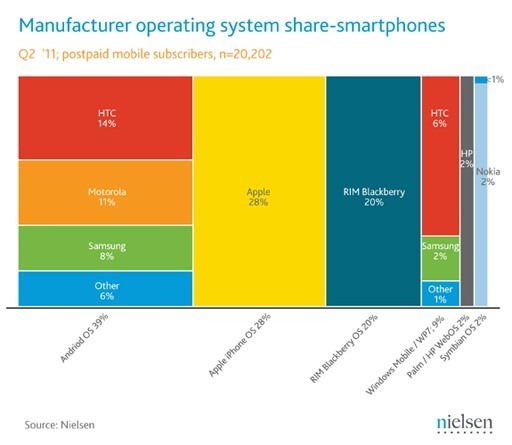 Additionally, HTC's combined market share (that is, Android OS + Windows Phone) is actually 20%, which is the same as RIM's. It must be particularly good news for the Taiwanese manufacturer to be tied for second place in terms of manufacturer market share.